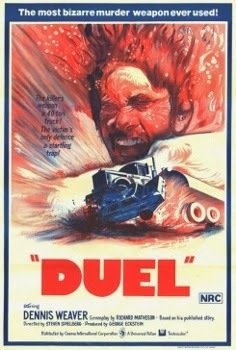 Duel was released on November 13th, 1971. Filming locations include Acton, Santa Clarita and Toluca Lake, CA. School bus tunnel scene - Soledad Canyon Rd. Ca. Train track scene - Soledad Canyon Rd. and Crown Valley Rd. 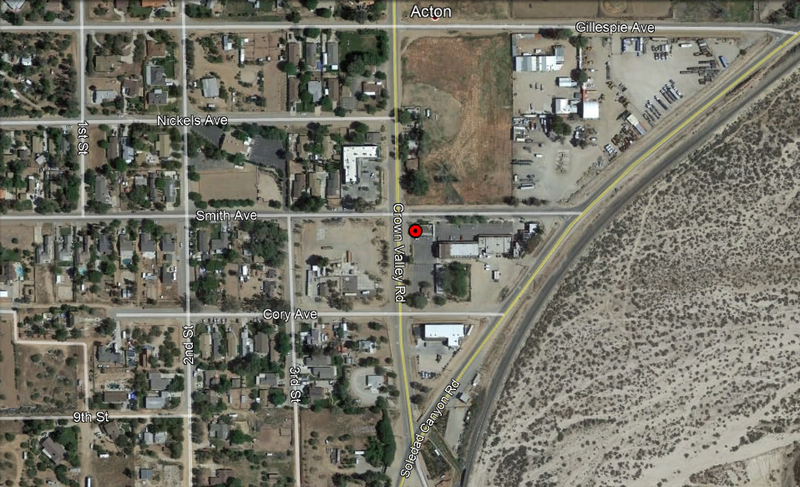 Acton, Ca. Truck follows David to the plateau - Mesa Dr. and Vazquez Canyon Rd. Excellent research. Must be great driving aroung looking for exciting places with your laptop or tablette on the passenger seat. Well done ! Nice work! Do you know the exact location of the cliff from the finale? Thanks Christian. I'm sorry, I haven't been able to track down the exact spot where the semi went over the cliff yet. Hey paul, the final cliff scene is located on cruzan (mystery) mesa. The final crash is on the ridge just off Vasquez Canyon road. There is a hard left which has a road doing a 180 to Vasquez Canyon road. 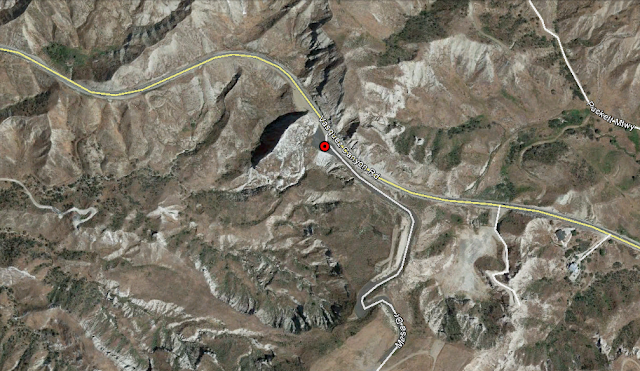 Here is where he hit the embankment, then continued up onto the plateau. The car and truck went off somewhere up there. 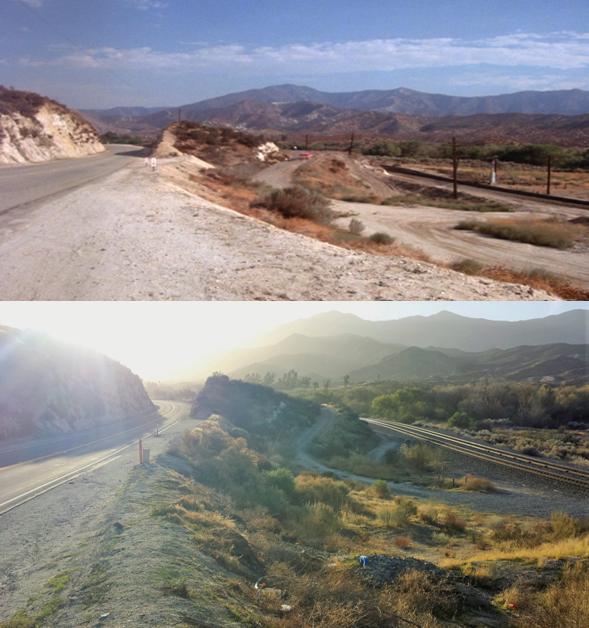 Which road did a 180 to vasquez canyon road? raf, you're absolutely right! I plan on visiting this location the next time I'm in the area. Thank you. The road that goes to Vasquez road and does a 180 is called Mesa Drive! Now I am trying to find where the truck went off. 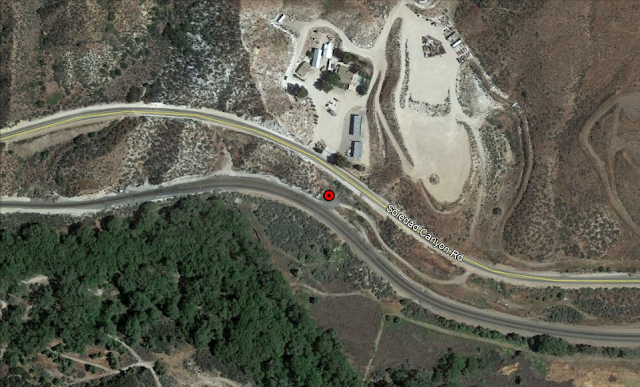 Think I have the location of the cliff and what looks like a broken in half truck?? I recently went up to Mystery Mesa for a job. It's a closed area but I took some pictures after I wrapped. Damn, so the actual truck is still there? That's crazy. Can you confirme the truck was still there when you were there ? I found a location from the opening bumpercam montage. It's at the Palace, on Broadway in downtown L.A.
Also, the one before it ends at the intersection of Broadway and 7th St. The early tunnel scenes are on CA-110 next to the Dodger Stadium. A LOT of cars went over that cliff in the 70s. Just about everyone on your favorite old TV shows. I GO TO THE LOCATION IN FEB 2016! I figured it out. The final cliff scene in Duel was filmed at cruzan mesa. It can't be accessed from vasquez canyon road but it can be accessed from plum canyon fire road to the south. My son and I are watching it right now. Thanks for the background. 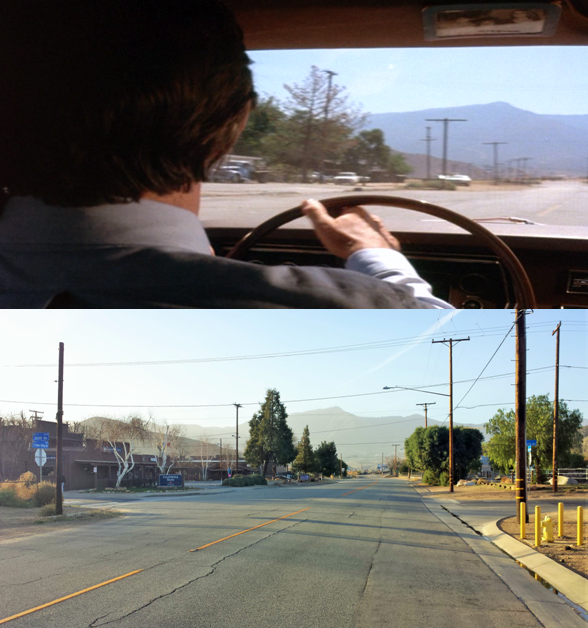 Movie holds up but SoCal sure has changed since 71! excellent research. When I first watched this movie, I wondered where on the earth this place is. Now I can locate the place by Google Earth. Duel aired tonight (Saturday) on Svengoolie. Nice to see the settings. 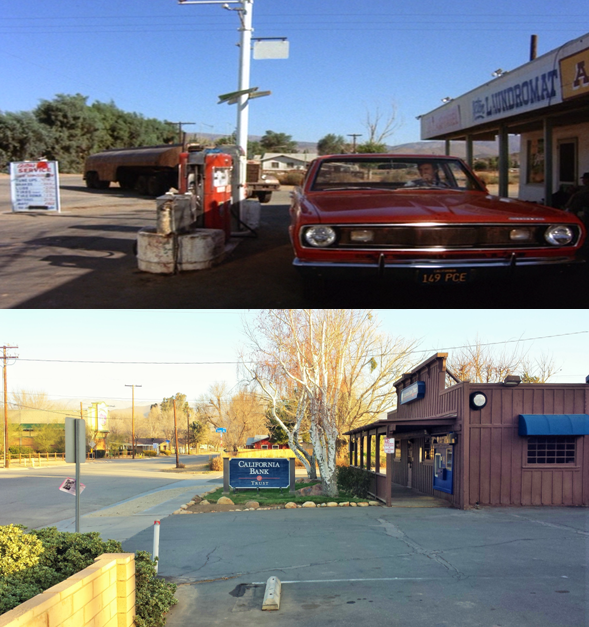 I lived in Antelope Valley 1980-98 and often traveled on the roads used in Duel. Man, I'm jelous of you! Lol! I've thought about finding the film locations of these great movies constantly since I was a toddler! Thanks for all your work and devotion. I have to go to Yucca Valley California on the 5th and I'm going to try and find some of these places on the way. Unfortunately, I won't have much time and will be traveling with 2 young ladies who have zero interest in these things and I'm betting that by the time we get that far (2000 miles), they really won't have any interest in it. I'll just have to try and pretend it was purely coincidence that we are driving past and "BOY, I REALLY HAVE TO GO TO THE BATHROOM! " LOL! Brent, I'm jealous out of you! You have TWO young ladies?! Can I be with one of them, then you'll have more time, okay? were you able to access the truck remains to confirm? or anyone on this chain? Awesome job on these locations. I can't wait to go to them!! I went there this past Sunday (04/23/2017), awesome see that a lot is still the same. Just a heads up, trying to go the plato, if you take Sierra Hwy and turn on Arline St to try to get to 34°28'07.8"N 118°26'01.6"W where the truck is still there today, make sure you have a 4x4, make sure you don't take anybody's property entrance by mistake, I almost got shot there by an angry crazy fella, but unfortunately my car didn't make all the way to the plato. Everything else was amazing. Tks for the tips, helped a lot. So you can go up on the cliff from Arline Street without calling for permission? Sorry if I sound a bit dumb, but what are we actually saying here.... The lorry was never removed after the crash scene was filmed and is still there today?? Hey. 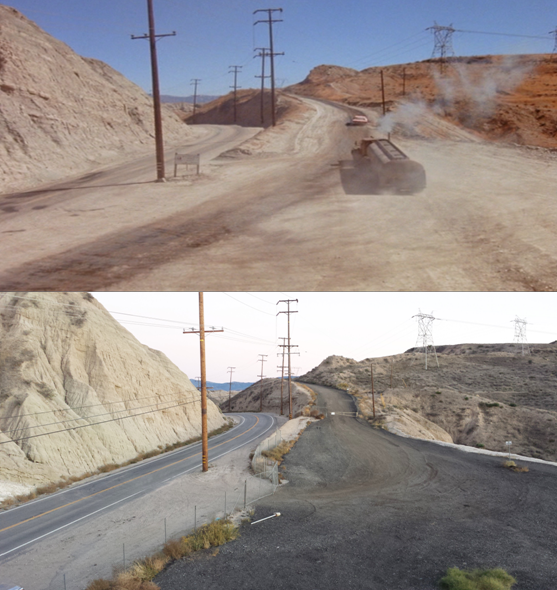 Watched this as a kid with my dad in the seventies and remembered how cool all these remote desolate roads looked. Just watched it last night (10 June 17) with my two sons and they were mesmerised. Great how an old film can still carry the suspense in these days of CGI. Brilliant website and excellent info. I have looked on the locations mentioned on Google maps but can't make out the truck that was left behind.. Can anyone confirm. Is the gas station / laundromat somewhere near Acton still in existence? "Fill it with ethyl." "If Ethyl don't mind." This was where David Mann made the phone call to his wife. Here I am answering my own questions. After some research on the Internet involving GOOGLE aerial photos and streetview pics, plus Historic aerials, I'm certain the Gifts & Apparel / Acton laundromat / Acton Service building where Dennis Weaver had his car filled with gas and he called his wife from the laundromat was located at the southeast corner of Crown Valley Road and Smith Avenue in Acton. The building has been transformed into a California Bank & Trust outlet. If it's the same building, it has been heavily rebuilt. The whole area has changed considerably since 1971. When the truck pulls in alongside the car, you're looking north. The scene took them a long time to film. When Weaver first pulls his car into the gas station, the sun is in the east and the building is casting a shadow completely over the car. When the attendant slams the hood closed, the sun has moved across the sky to the west and the car is no longer in a shadow cast by the building. 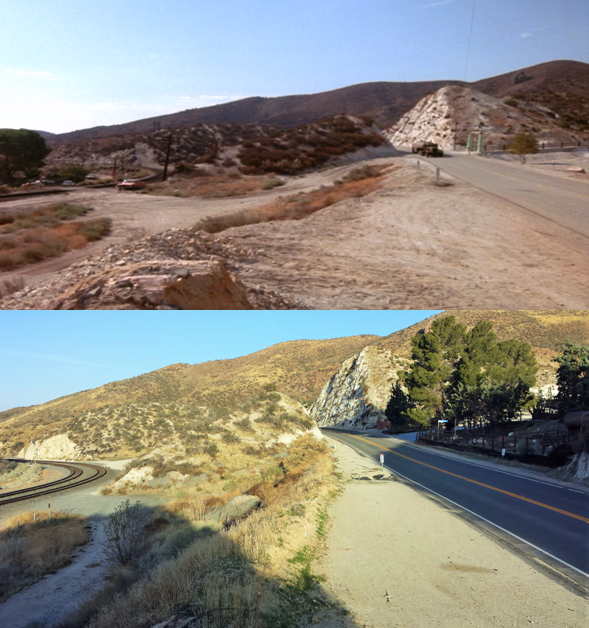 The location where Dennis Weaver's character pulls off the road, takes a brief nap, and then has his sleep interrupted by a passing train was filmed on the south side of Soledad Canyon Road. On the north side of the road is the Middleton Ranch, at 6201 Soledad Canyon Road. This is a site dedicated to location film shooting. Since 1971, the junkyard on the south side of the railroad track has been removed. The rail line at this location has transitioned from a single track to double track. I would like to add that if u think about it this movie is really like a movie length version of an episode of the Twilight Zone. The sound effects are very similar in the scene transitions and also any TZ fan knows the screenplay of Duel was by Richard Matheson who actually wrote many TZ episodes. Duel: They handed young Steven Spielberg a tiny budget and a good writer...and look what he did with it. The rest was history. Hello, my name is Manfred, I'm from Germany, and Duell is still one of my favorite movies. When my wife and I planned a vacation in California for 2018, I began researching locations and tracks for the film. Nice job Manfred; will be visiting from Alberta, Canada to these locations soon!